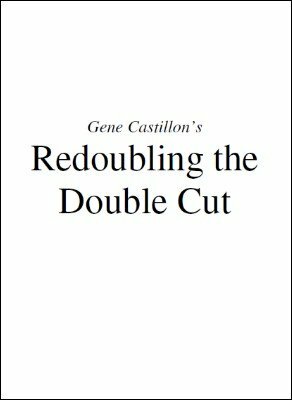 Gene Castillon presented this lecture at a meeting of Ring #27 IBM in the early 70’s, calling it "The Double Undercut Routine". This routine was designed to feature only one sleight or move—the Double Undercut . To prove the versatility and usefulness of this one move, Gene incorporated into one routine a series of different effects all accomplished by this one move. As you will discover, there are magic appearances, a simple sandwich prediction, several Ace tricks, a poker deal, and a simple triumph trick. When recently asked to lecture again, Gene pulled out his old lecture notes and was surprised to see that this old routine still packed a powerful punch—even after thirty years. He also noticed how this routine contained many principles and approaches now used in memorized deck work to retain partial set-ups and stacks. He hopes that this routine will inspire students to consider applying these partial stack principles and approaches to your own magic performances. The power of a delayed stack is devastating and should be in the arsenal of every magician. Michael Skinner, a close-up master, believed that magic should be learned in groups of three. Instead of mastering a single trick or effect, he advised linking three tricks or effects together into one seamless routine. His approach was always to learn the routine—not individual tricks. The power of this approach results in a two-fold benefit. Your performing repertoire becomes dramatically larger and your performance becomes more theatrical and polished as you segue seamlessly from one trick to the next. 1st edition 2006; 14 pages.